We're sad to report that Goofy, one of our most engaging box turtles at the rescue, has crossed the Rainbow Bridge. Goofy passed away before World Turtle Day® in May while we were rushing ahead with this year's plans. Rather than announcing his passing, we decided to wait because he would have wanted it that way. 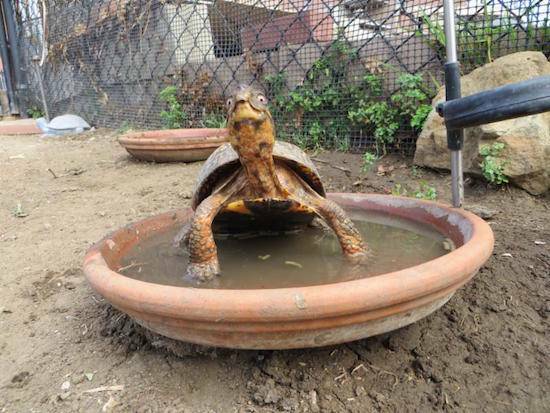 World Turtle Day is the annual day we celebrate all turtles and tortoises throughout the globe. Goofy was always making us laugh with his wonderful sense of humor and beautiful smile. He looked like he enjoyed himself standing on three feet and waving his paw saying, "Hey I need a worm over here." We believe that he was very old and pretty much blind. You can tell an old box turtle by the diminishing red in their eyes as it turns white over the years. So, we lovingly hand fed him many worms during the all too short time we had with him. As he grew older, and a tad more senile, he would launch himself from his main yard over a foot high wall into the boggy yard where the turtles who don't swim well live. We marveled that he was able to come and go that way. But, we also believe that turtles know what they want, so we don't interfere. Perhaps he had special friends over on that side. Then, sadly, one day he was found unconscious by the wall and died shortly thereafter. We could have kept him in the house permanently not allowing him to cross back and forth to visit this friends, but that would have made Goofy miserable. He died doing what he liked to do. We still have a few Goofy t-shirts left. Now they are even more special. See Goofy Has His Own T-Shirt. For more information, send us an email at [email protected].